On Saturday, December 10, the Kalamazoo Nature Center will host the 2011 Buy Local Art & Gift Fair. Lots of artists this year and a really fun event. I will be on hand to sign copies of The Story of Snow from 1-3 PM. For more details, click here. It’s a cold winter’s day in Prague, late in the year 1611. A man walking home is worried because he has no new-year’s gift for his friend, benefactor, and fellow philosopher. Upon crossing over the Charles Bridge, some snow crystals quietly land on his coat. The crystals at first distract his thoughts, and then bring great delight. Of course! 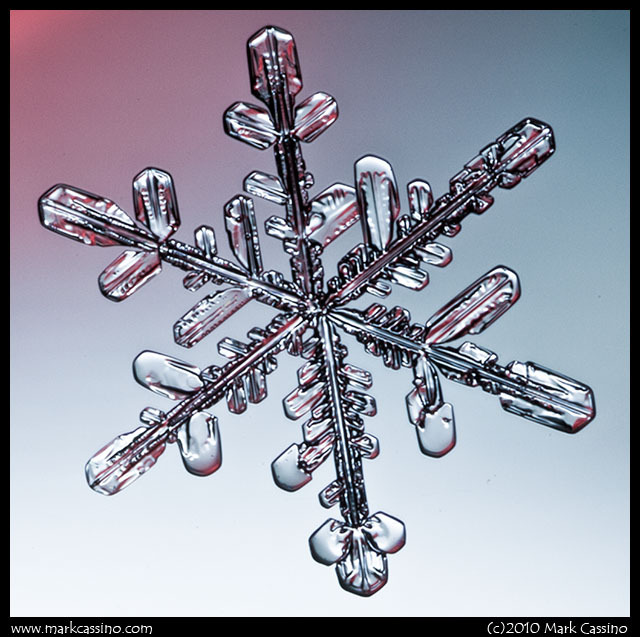 The six-cornered crystals on his coat have brought a philosophical puzzle to present to his friend: Why, he asks, do they always fall with six corners, not five or seven? What is the origin of the number six? Who shaped the little head before it fell, giving it six frozen horns? Indeed, what is the origin of the six? 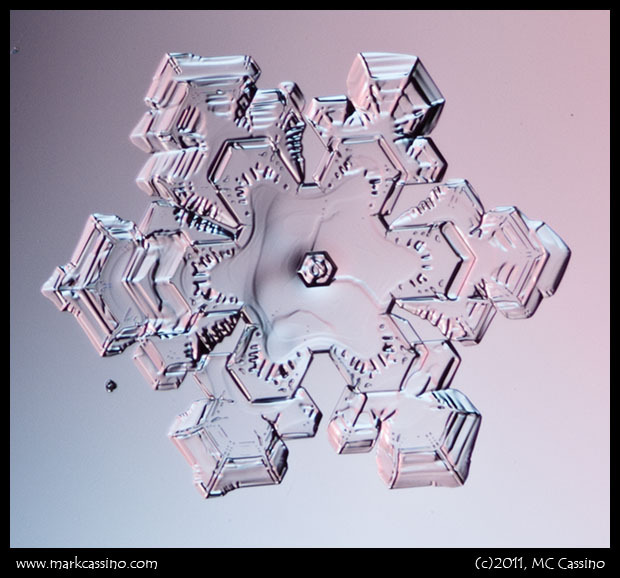 Why do snow crystals often look nearly the same when rotated by 1/6th of a turn? Johannes Kepler, like others in his time, did not have the atomic theory of matter to use as an explanation. But he was nevertheless on the right track when he later wondered whether ice bore a relation to the honeycomb of a beehive(1). 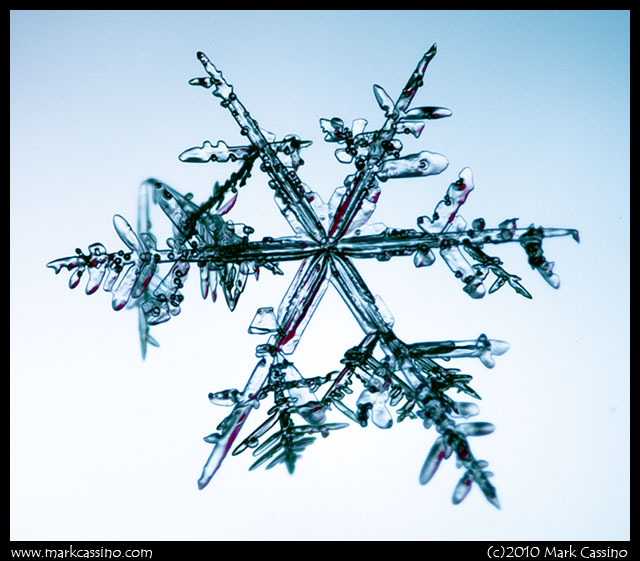 Indeed, the honeycomb structure is very similar to what we see in the internal molecular lattice of a snow crystal. 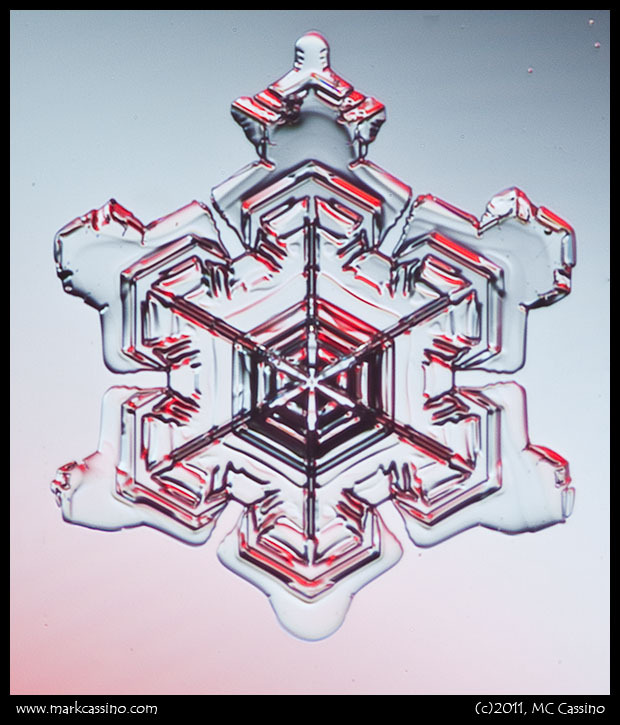 If you could zoom in about a million times into any region of a snow crystal, such as the branch tip in figure 1A below, you would see a lattice of hexagonal rings, as sketched in B. Each ring of six oxygen atoms (black) has the six-fold symmetry; that is, the ring looks the same when rotated by 1/6 of a turn. This six-fold symmetric pattern inside ice provides a simple, though rather superficial, answer to the origin of the “6”. But things are not so simple. If you examine the rings further, you will notice that their sides are all rotated by 30º in relation to the sides of the crystal. Why the 30º twist? Moreover, if you look at the orientations of the molecules (i.e., the red hydrogens), you will see that the rings are actually not six-fold symmetric. And, upon turning the ring on its side, as in C), notice that it’s not even flat. So, at the very least, the simple answer is incomplete. For the first few years in which I would excitedly go out on frosty mornings to photograph ice formations, I never paid any attention to frost on car bodies. Sometimes I would notice something on our car window, but that was basically it – I was essentially blind to ice in places where I didn’t expect to see anything interesting. Then one day, while returning from an area that often had fascinating puddles and ground ice, I walked next to a black car with the most stunning display of frost that I had ever seen. The car was completely covered roof, hood, and trunk with a thick, large, curvy white pattern of ice made distinct by the background of black underneath. I spent the next hour or so taking pictures, returning home once to get another camera when my roll of film ran out. 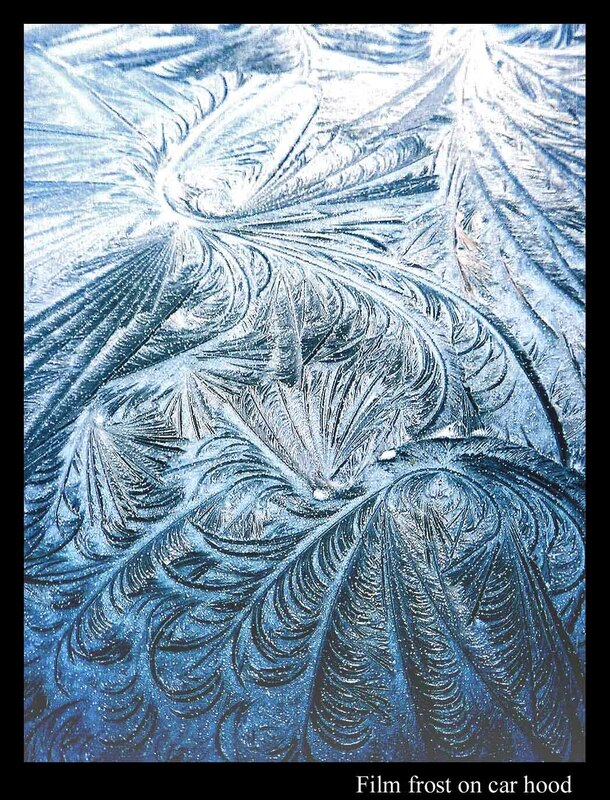 Though I understood roughly the processes involved, the initial freezing of a thin layer of water, making curvy ice patterns, followed by vapor depositing onto the frozen parts as hoar, making the ice white, there were other puzzling things that kept me entertained. However, the most puzzling thing of all was the fact that people would walk right by without even slowing down. Here was a strange and rare sight: strange because of the hastily dressed man (myself) leaning over a parked car with a tripod snapping pictures, and a rare yet striking display of curving frost in full view, and yet they paid me nor my prize no mind. It was as if I was the only person who could see the pattern. The reverse thing happened to me just a few days ago. We had wet weather one day followed by a cold, clear night – perfect conditions for good hoary film frost. 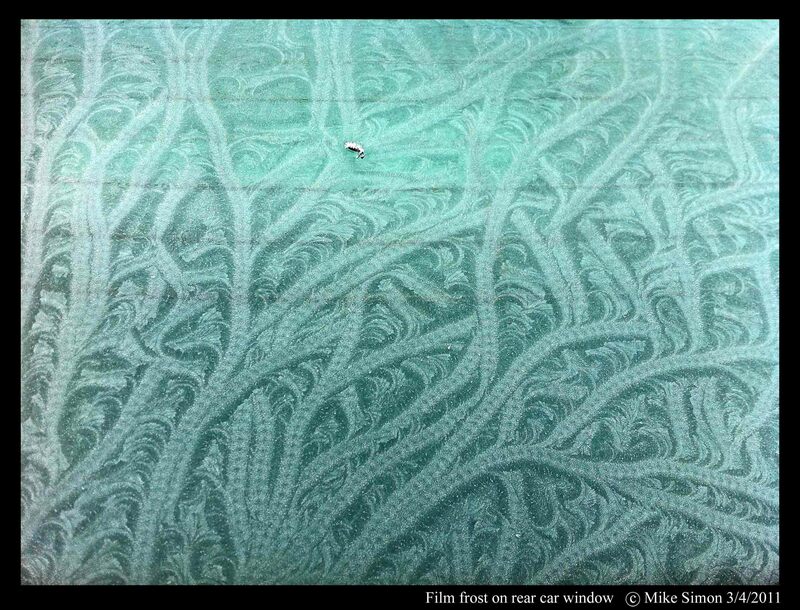 And indeed, many cars in our parking lot had beautiful curvy film-frost. I walked around, looking specifically for black cars, which show the most contrast to the white hoar, and photographed some on one car, but somehow overlooked the most amazing one of all: a speckled-seaweed-like pattern that I've seen only once before (see the Dec. 1 posting). Even though the above was on a black car in a region I checked, I still missed it. But luckily, my neighbor caught it and emailed a few photos. In the image, some of the trails seem to cross over each other, but closer inspection instead suggests a coincidental merging of two trails on one side with a forking off on the other side. Someone recently sent me a beautiful image of an ice structure in the shape of a vase. The vase in that case had somehow sprouted out of a frozen birdbath. 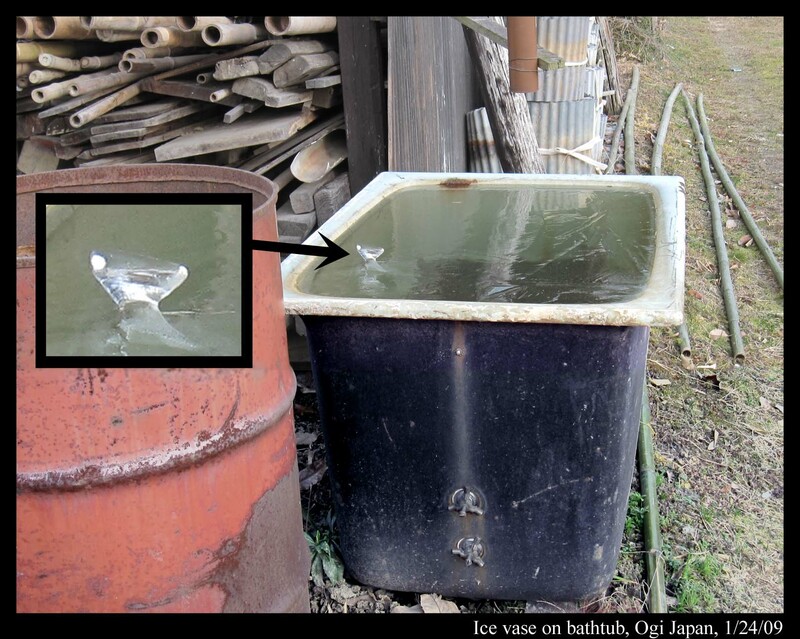 The thing reminded me of an ice vase I once found on an old plugged-up bathtub in a farmer’s field in Japan. See the photo below. On approaching the tub, I first thought the ice bump on top was some chunk that had fallen off the roof and refrozen. But on closer view, I found that the thing had sprouted out of the surface. How did I know? Well, as I leaned over it, my body pressed against the tub wall, and I noticed something move. Turned out it was water on top, filling up the vase to the brim! See the sequence below. Clearly, I’m not pushing that flimsy twig through solid ice. Of all the curious things I’ve seen here, never before nor since did I see something like this water-filled ice vase. However, the vase forms in much the same way as the somewhat-more-common “ice-cube spikes” that sprout from ice cube trays. But how do such spikes and vases form? We had a blizzard last night. (By 'we' I mean the mid section of the continental United States. ) Here in Michigan it started in the early evening, quickly accelerated, and lingered on till around noon today. At least a foot of snow fell overnight and in the morning. I reckon more like 16 inches. 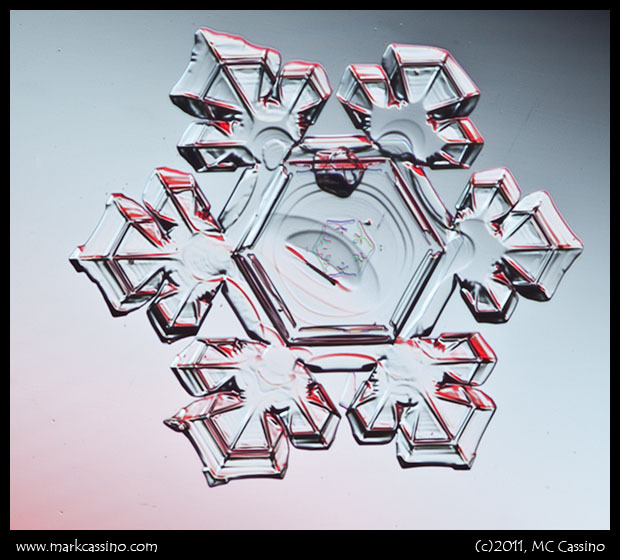 Blizzards and other major snow events usually are not conducive to taking snow crystal photos. At least that has been my experience. 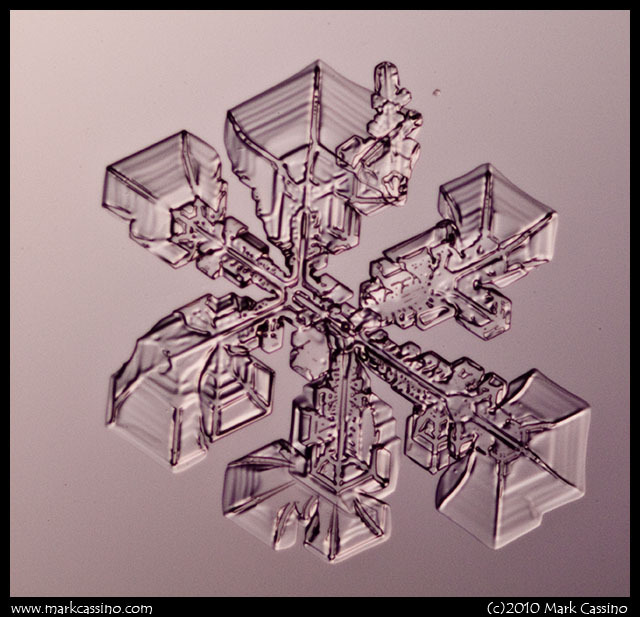 The snow crystals are usually broken, battered or clumped together. A blizzard is particularly rough on the crystals, since by definition a blizzard has damaging high winds. I ventured out a few times last night to watch the snow flying in the night, in the howling storm. As expected, any perfect crystals had been destroyed. But this morning I managed to find a few intact crystals that fell from the sky, and took their photos with a crimson light. An acquaintance of mine recently discovered these odd discs of ice. What we think happened is this: Foam floating about on the water, which you can see in the video, started to freeze, probably at night. Bits of frozen foam got pushed around in the eddy, and in the ensuing collisions, became roughly circular. 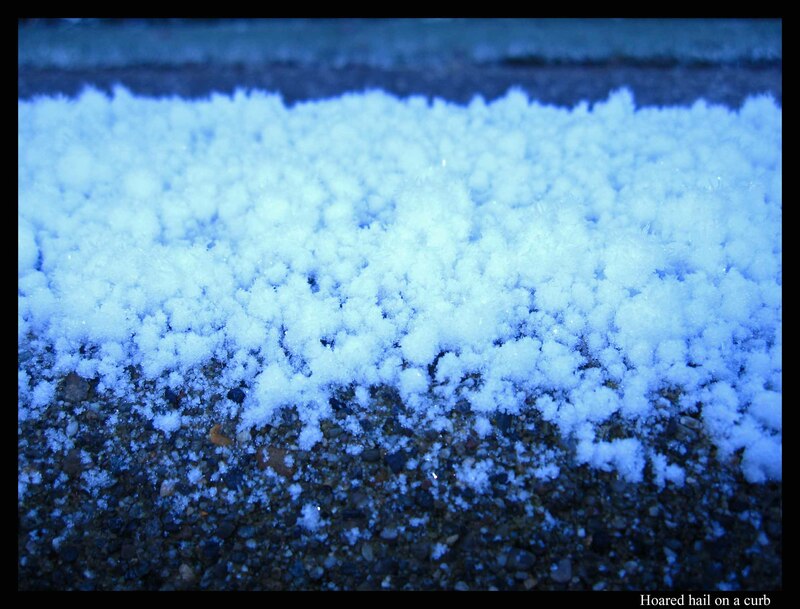 Perhaps each disc grew radially when smaller pieces of unfrozen foam struck the disc, adhered and spread out a bit along the perimeter, and then froze in place. The raised rims are undoubtedly due to the collisions. 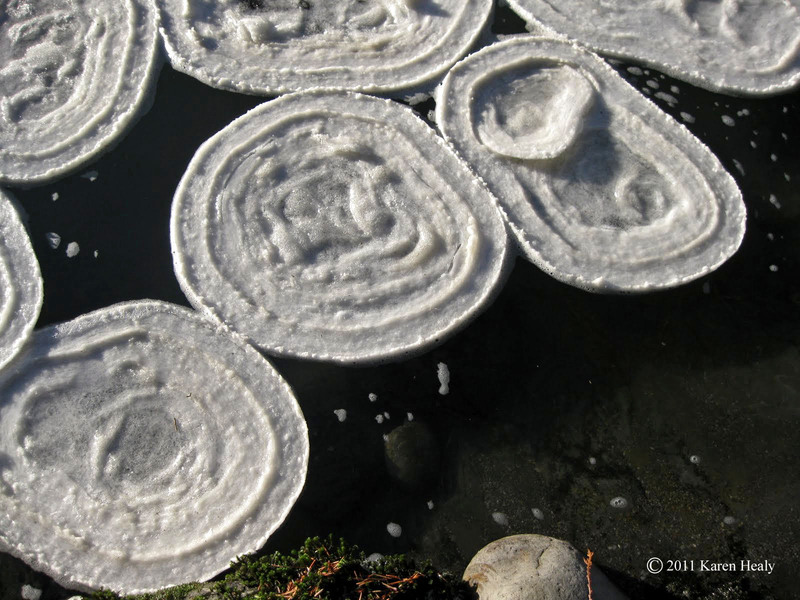 One sees such rims on “pancake ice”, which is also said to be due to collisions, but what about the concentric raised regions inside the discs? 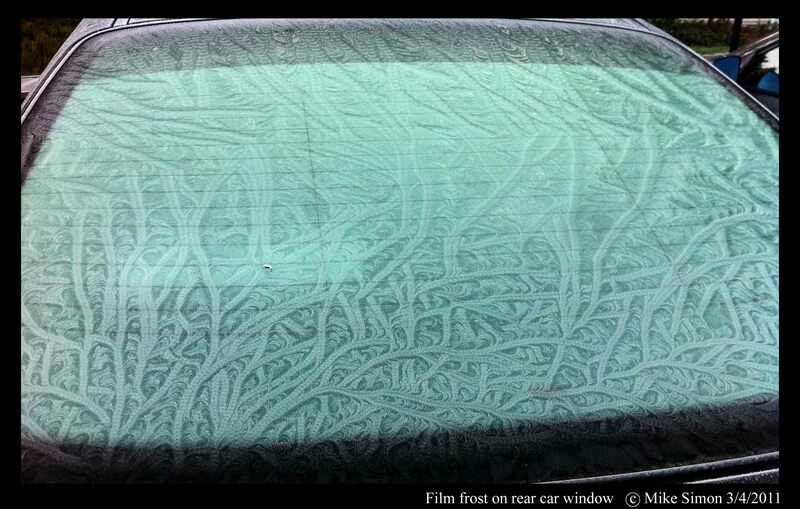 None of the images of pancake ice on Google seem to show these inner lines. Here’s an idea about those lines. The air temperature oscillated during the growth of these discs: colder at night due to the clear-sky conditions and resulting radiative cooling, but warmer in the day. The discs may have grown at night, collecting new foam, then during the day, when the discs softened in the sun, softening particularly around the edges, the collisions raised up the rims. The next night, further radial growth followed by a new rim the next day at a greater radius. The pictures and video show 4-5 such rims, indicating growth over 4-5 days, which is roughly consistent with the duration of our cold snap. During my last winter in Japan (2009-2010), I would walk around a neighborhood park on frosty mornings, looking for interesting ice forms. It was in this park that I found one rock (only one!) that on some mornings would sprout hair-like ice, arising from liquid water within (see the last images in my “Ice on the Rocks” post, Jan 27). This park also has a small, slow-flowing brook that, despite the relatively warm conditions, often freezes over. Usually, upon freezing, it shows an ice pattern consisting of many long (~ one foot) straight lines – a typical pattern you usually see on glaciated puddles and ponds. But on the morning of February 4, at one spot right before the water tumbled over a waterfall, the ice surface looked slightly different. It had lines, but the lines were short, thick, and bumpy (see photo below), looking a bit like black-blue caterpillars scattered about. From the small bridge spanning the brook, I reached down, pulled some ice out, and was shocked at what I saw. 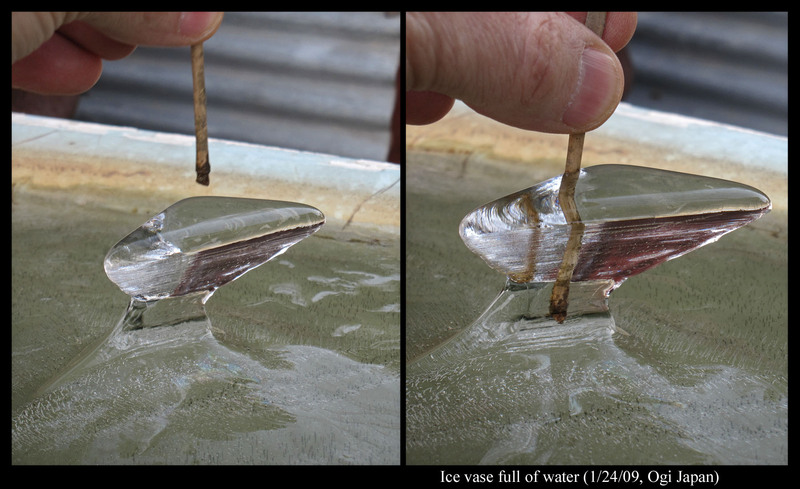 This was not “solid” ice, but rather a bunch of very thin ice plates loosely resting on each other – somewhat like a deck of cards spread out in a fan, though in this case, each ice plate had its own size and shape. 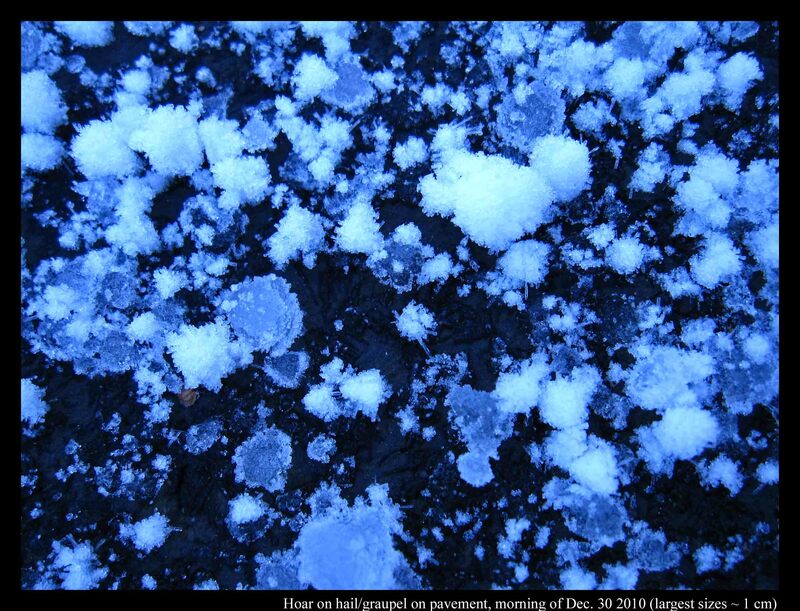 Also, unlike other thin ice plates I’d seen before, these ones resembled neither the fast-growing ice dendrites (the snow-crystal-like, branched forms) nor the slow-growing ice discs. The photo below also shows that the plates were big – the section shown being several inches across. 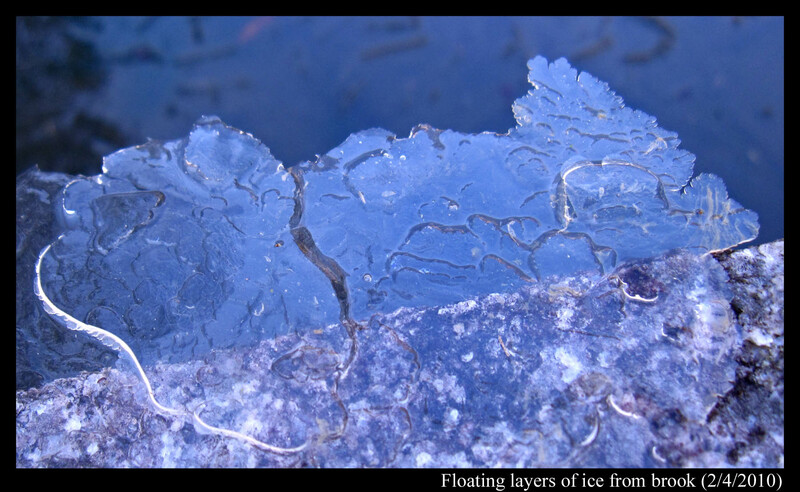 Over larger streams and faster-moving water, ice can develop into something called frazil ice. I’ve no experience with frazil ice, never having lived in a cold-enough region, but I this caterpillar ice may be different. For one, the water was extremely slow-flowing. I could not discern the flow, even in ice-free regions, whereas the descriptions I’ve read about frazil ice involve easily discernable flow rates, flow rates that introduce turbulence, crystal collisions, and mixing below the surface. 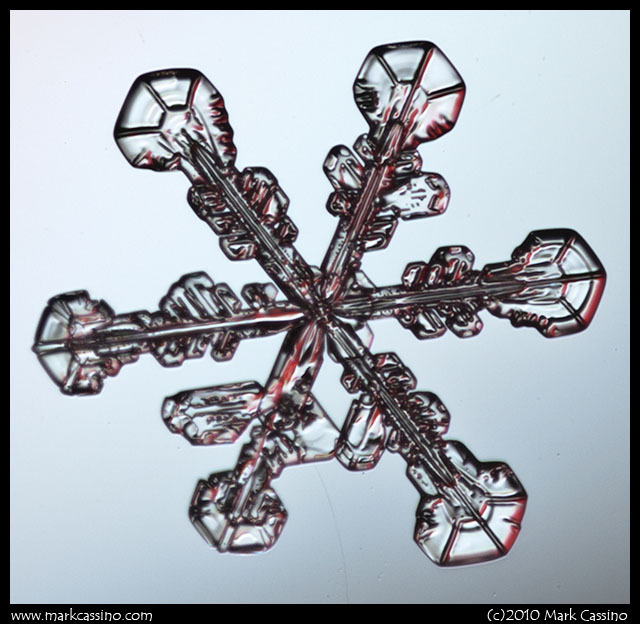 Also, the ice crystals I saw were much larger than the millimeter-sized pieces I see reported for frazil ice. 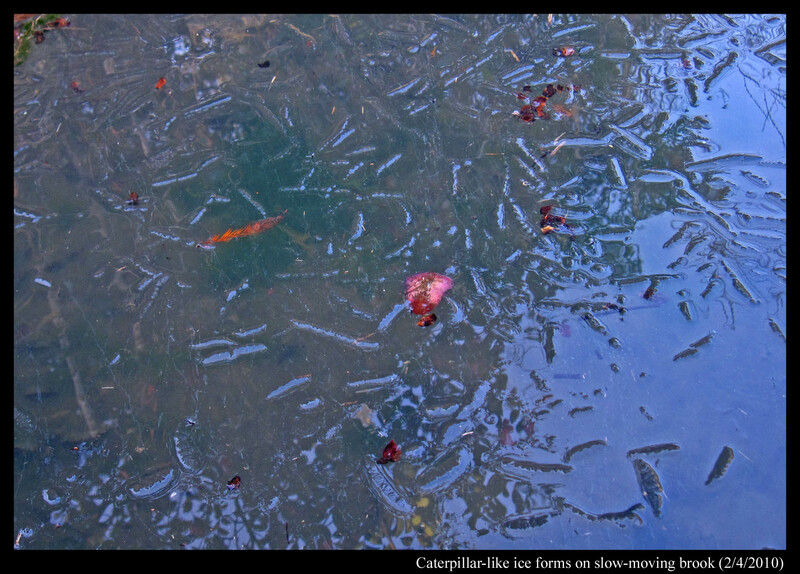 So, the caterpillar form might be a transitional form, between frazil and that over stagnant water. As far as I could tell, nobody had predicted hail last night, yet there it was on the ground, the largest hail I’ve ever seen here in the northwest. It fell on wet ground, freezing to the surface and then growing hoar columns, making the ground white and crunchy. The parking lot in front of our apartment was covered in ice, mostly clear (i.e., "black") ice, yet, because of the ice lumps, it was not slippery under my boots. I kept expecting to slip, but never did. On the curb, where it was a little colder, the hoar was much thicker, looking like an inch of snow. Same story for the tops of cars, where it had been coldest. The temperature was such that the hoar was mainly columnar. 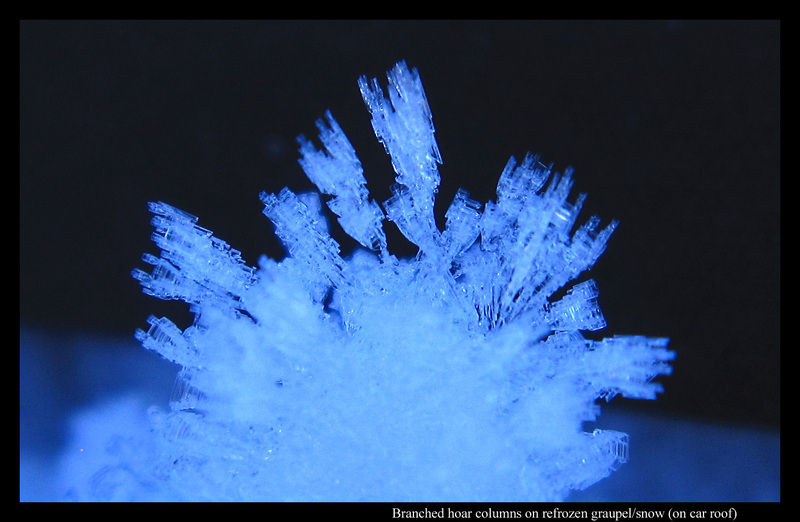 Columnar hoar, indeed all hoar, grows just like snow – when an excess of water molecules deposit from the vapor – and yet columnar hoar tends to develop more in the “cup” (C1b) and “scroll” (C1i) forms (see my Feb. 14 posting for the meaning of the symbols). But unlike the pencil-like columnar forms of falling snow, these cups and scrolls grow broader at their growing end, even branching out into a pattern a bit like coral. And if you look closely at the above shot, you will see that the “branches” grow along the same axis as the crystal from which they sprout. (For the above shot, I put a piece of black cloth in back to show the boundaries more clearly.) 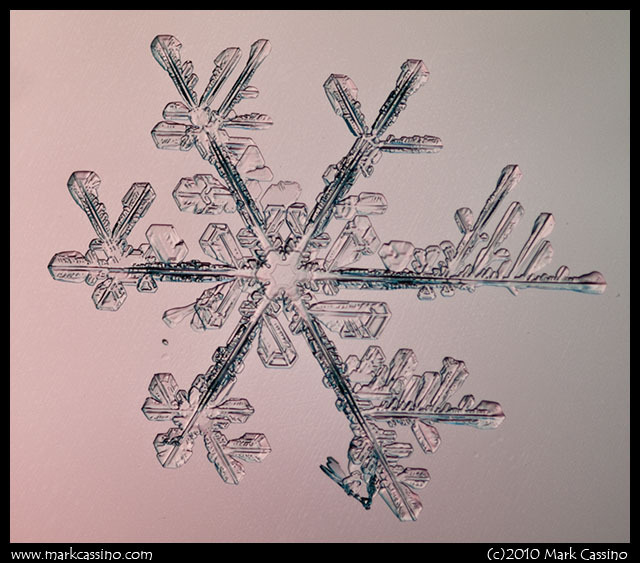 Such branching contrasts with that for tabular crystals, such as the ones on the familiar six-branched snow crystal. Why do the columns widen at their growing ends, thus making a cup-shape, why do the cup rims sometimes curl into scrolls, and why do they branch out? I suspect the reason for all three (though not a complete reason) is that the humidity next to the growing crystals is very high – higher than that surrounding the typical column form that drops from the sky. Unlike the latter case, where the humidity is too low for the prismatic faces to grow outward, at least at any rate near that of the basal, here both the basal and prismatic faces grow at comparable rates. Such growth behavior also depends on the temperature, for reasons that still elude us. This December has proven to be pretty cold - I noticed folks ice fishing in the last few day s- but aside from a little snow at the start of the month, it's been pretty dry. 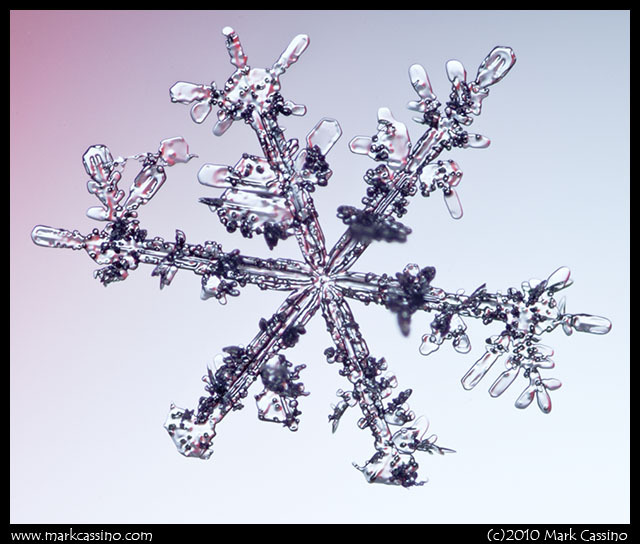 Here are a few more snow crystals from the second good snow of December . As this month winds into the holidays and then to an end, no snow is in the forecast. Hoping for a productive 2011! As always - click on an image for a larger view. Hard to believe that one week ago today it was a balmy 53 degrees and warm gentle breezes were pushing the last fall leaves around on the sidewalks. 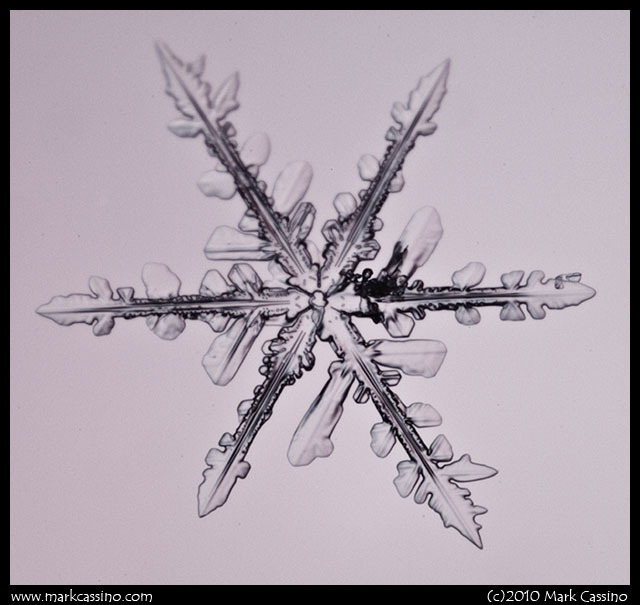 The temperatures have dropped, the lake effect snow has begun, and here we are on December 6, with the first snow crystal shots of 2010/11. They aren't particularly interesting, but they hold the promise for more to come.